I am a beachophile. Having grown up on Plum Island, north of Boston and lived in Sarasota, Florida for 10 years, salt water is in my blood. Florida appealed to me because as a veteran Northeasterner, I wanted to get away from the snow and ice. While living in Sarasota, a place that I considered paradise, I visited Costa Rica for the first time, at the suggestion of a friend who had been there many times. My first visit was in 2003 and I spent a couple of days in the capital San José and a week in Manuel Antonio discovering the south Pacific coast. Over the next five years I made a total of seven more trips to Costa Rica and always ended up in the Quepos/Manuel Antonio area. So in 2008, I retired to Quepos…and found my new paradise. I moved to my Costa Rican paradise because I wanted to get back to a greater sense of natural beauty and wanted to live a simpler, less harried lifestyle as a retiree. Although the beaches where I lived in Sarasota were beautiful, rapid Florida development had led to the beach being completely surrounded by condos and other developments. 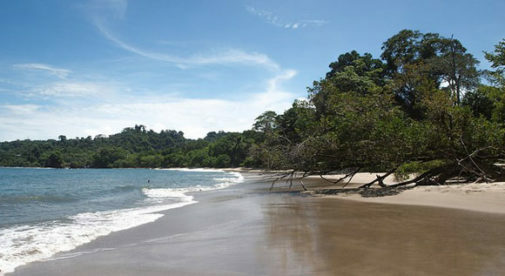 Here in Quepos, I can hop on a bus and 15 minutes later I’m on one of the most beautiful beaches in Costa Rica…and when I look around on Manuel Antonio beach, all I see is pristine jungle and soft white sand. And the ocean is always warm here, even in December, January, and February when it can be a bit chilly in Florida. After moving to Quepos, I began to email friends and family and gradually this turned into a monthly newsletter called the Golden Gringo Chronicles. The name comes from being in my golden years and also that life here is golden and I realize how lucky I am to live here. Writing about my retirement adventures not only gives me something to do in retirement, but it has also helped me learn about the history, culture, legends, and characteristics of life in Costa Rica. In the eight years I’ve lived in Quepos, I’ve met many expats considering a move here and there’s two pieces of advice I always share. First, decide what kind of climate you like. Does the brisk, cooler mountain air of the Central Valley appeal to you or perhaps the hotter, more humid coasts? The good news is you can find a climate that exactly fits your preferences in Costa Rica. The second thing is to move here and rent the first year. This will give you the opportunity to learn the local customs, the bureaucratic anomalies that sometimes frustrate fast-paced expats, and the intricacies of owning property here should you decide to buy. And if living in that particular town isn’t for you, you can find the place where you’ll be happiest in Costa Rica. I have never once regretted the decision to move to Costa Rica’s Pacific coast. The natural friendliness of the people and the great climate strengthens my bond with my new paradise…and I expect to be here a long, long time.